Unless you’ve been living under a rock –or have lost your body and soul to Flappy Bird— President Barack Obama is to visit Enrique Peña Nieto (aka as the Savior of Mexico) this week in Toluca, Mexico, and –as it has now become a tradition– this blogger got exclusive access to the one-day agenda. For the uninitiated, Peña Nieto is married to Angélica Rivera, a hot blond Latina, who once starred in one of Univision’s highest-rated novelas: Destilando Amor, which by the way was so awesome and successful, it even earned me a byline in none other than The New York Post. Oh, and in case you were wondering: This is not the first time these two get together. 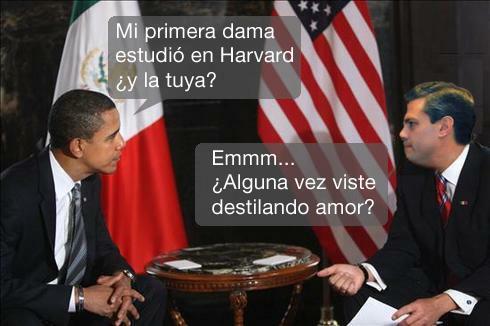 Mr. Peña Nieto first visited Obama in November 2012 at the White House, giving this blogger an opportunity to offer simultaneous subtituleishon. This entry was posted in Latin America, Mexico, Politics. Bookmark the permalink. Hmm, I wonder if pres Pena Nieto will give out Sorianna cards to Obama’s entourage ? Nice public relations idea, not likely his backers will mind.